Brad Hand has hit a bit of a rough patch in June. He’s been touched up to the tune of five runs in his past four outings, including a pair of blown saves against Oakland and San Francisco. His ERA has risen from 1.78 to 2.82 in only 11 days. 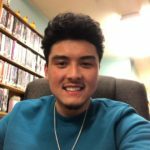 This recent performance has undoubtedly complicated an already complex situation regarding his future with the ballclub. Hand’s body of work in San Diego over two-plus seasons certainly outweighs a tough two-week stretch. He has proven to be an elite closer in this league, and that doesn’t change based on a couple bad outings. It is also important to note that Hand started the 2018 campaign in a similar fashion, giving up eight runs (albeit only two of them were earned) over his first four outings. Regardless of the defensive miscues, however, he was clearly missing spots and creating opportunities for the offense that otherwise would not have been there. But guess what? He rebounded in a big way, tossing 8.1 scoreless innings directly following his three-run, three-walk outing against Colorado on April 5. He had since produced top-tier-closer results until his recent hiccup. It’s no secret that Hand has been a topic of trade discussions for well over a year now, and A.J. Preller surprised a lot of people by holding on to him at last year’s deadline. Preller’s asking price has been notoriously high for Hand for quite some time, and for good reason. This recent cold stretch can be looked at two different ways, and they both depend on how Hand responds over the next month. If he is able to bounce back and prove once again that he’s an elite closer capable of cutting through the heart of postseason lineups at a consistent rate, the last two weeks shouldn’t do too much damage to his trade value. In that scenario, a player like Devers could possibly be attainable. However, if Hand continues to struggle, Preller is going to have no choice but to lower the price tag significantly. 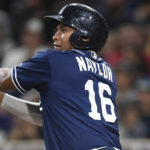 His team-friendly contract that runs through 2021 could lead to Preller scrapping the idea of trading him entirely and simply holding on to him. 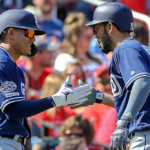 The problem there, however, is that a Hand trade at the 2019 deadline would not fit into the Padres’ organizational timeline. 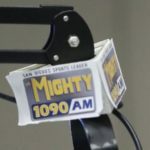 Ideally, 2019 would be the year that they move away from the “seller” mentality and start looking to legitimately compete in the NL West and beyond. But a closer doesn’t have much value to a non-contending ballclub, which is exactly what the 2018 Padres are. Young, star-potential talent is much more valuable to this team as it’s presently constructed. There lies the dilemma that will need to be resolved from now until July 31. 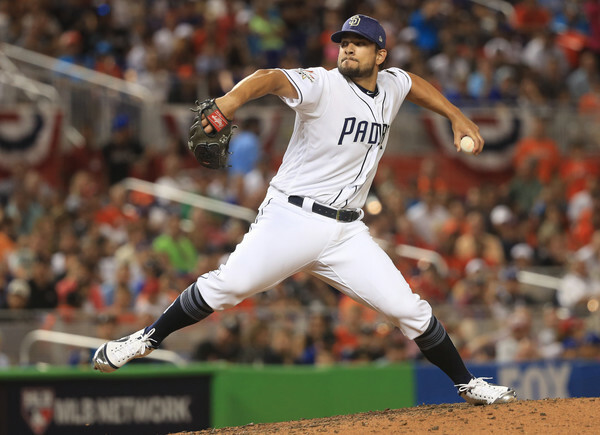 It’s going to be a tough decision for Preller either way, but how Brad Hand fares over the next month will hopefully provide the clarity needed to make such a franchise-altering decision. 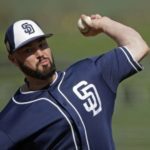 Next Mets Shopping Ace Pitchers, Should the Padres Explore a Trade? Green has greatly hurt Hand’s value by overusing and misusing him. Now it is best to hold on to him. Otherwise they won’t get much this go around. Maybe that is a good thing down the road. The Hand for Devers was all started by a Morosi tweet saying the Pads would ask for a top young prospect in return LIKE a Rafael Devers. And then the interweb does what the interweb does. Hand is solid, but has never been particularly dominant. He puts people on base constantly, and has blown four games. His baseball reference WAR is currently negative. He has a lot of saves, but so did Fernando Rodney a few years back. Preller is right to set a high price, but he shouldn’t get too greedy. If we can get Yordan Alvarez and a good pitching prospect in return from the Astros, I would do it. I would agree with that. The Devers example was used to show how high Preller’s asking price is currently. I do think, however, that Hand should be traded at THIS year’s deadline for the best offer. 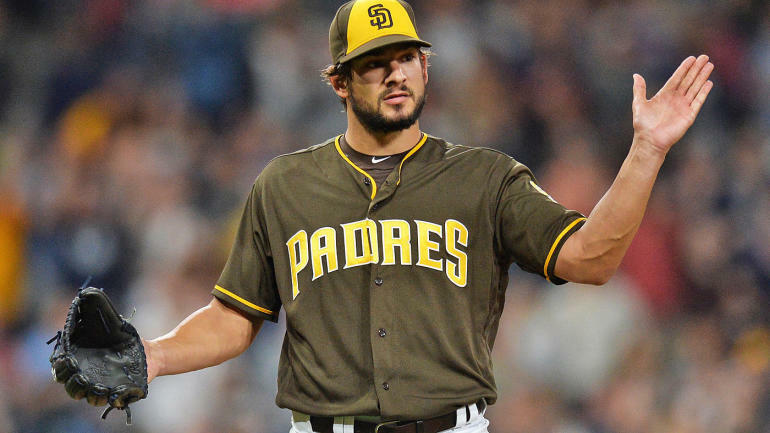 There’s no reason to keep him beyond this year, especially with the surplus of bullpen arms the Padres have right now. Brad is better than solid. Judging a RP by WAR is dangerous. The walks are up but still not alarming. I will grant you hit batters , its 6. Edwin Diaz BB/9 is 2.8. and he went like 20 games without giving up a BB. Brads is 3.4. H/9 for DIaz is 5.4 where Brad is 5.9. Diaz has an ERA+ of 156 where Brads is 144. Diaz also has 3 blown saves to Brads 4. One is perceived to be having a breakout season while the other is still being questioned and seen as failing. Regardless, the Padres don’t have many players that will command the type of talent they need in return. If they can leverage on overpay pitting ATL, HOU, NYY, CLE,BOS, CHC, LAD, LAA against each other, why not. However if Brad continues to have a rough go, the offseason would yield you as much and more teams would be in play. Brads 28 years old and under contract for 3 more years at a cost cheaper than what Miller got 3 years ago. Miller didn’t even have his all star seasons until age 31 and 32. You could easily argue they should ride it out. Bottom line there is a surplus of arms to take his place and Kirby Yates could be just as good. Building a bullpen has never been an issue for this team. So many opinions, so many thoughts. Some readers trust AJ Preller and seem to really like him! Others (like me) don’t. But I’m also one of those impatient fans who want the Padres to play 500 ball this year and contend for a playoff spot next year. Why else would the Pads sign Eric Hosmer? Don’t forget, Hosmer has an opt out in his contract after 5 years. That tells me the window to win is not as large as some people hoped for. As for Brad Hand, why the rush to trade him? Unless the Pads are overwhelmed by an amazing package; everyone thinks the Red Sox, that evil, big market $$$ team in the east, will ask for him, DON’T move him! As for THEIR young third baseman, Devers, what’s so great about him if the Red Sox are willing to trade him? Besides, how often has Boston gotten the better side of a deal with SD? We’re always getting “suspects” but they get the finished product! 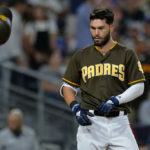 Isn’t it time the Padres trade some of their “suspects” for some quality? Mike Moustakis of the Royals is there to be had! How about the Pads give KC a few “suspects” and we plug Hosmer’s buddy in at third after we sign him to an extension? That would be a good start! If you and the Padres want Moustakas, why trade for him? He is a free agent at the end of the year and can be had without trading anyone from the farm system. 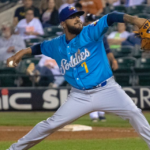 Plus, it seemed as though he was a “forgotten man” last off season, so the Padres maybe be able to get him on a discount deal if they just wait. 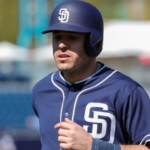 I personally do not think he is an answer to any of the Padres’ problems, but if they do look into him, I hope it is in the off season and not before the trade deadlines this year. I do agree with you assessment of the Red Sox/Hand deal. I don’t see a fit between the 2 teams, but if someone does blow the Padres away with an offer (Houston – Tucker or Whitley) then I would deal Hand as Balsley seems to be able to find diamonds in the rough on a regular basis.